As part of the Benton/Tama Project, we are monitoring field tile sites from local producers within Rock, Wolf, and Pratt Creek watersheds. Additionally, we are monitoring water quality in the creeks. The 2014 water sampling established a baseline, and 2015, 2016, and 2017 samplings are complete. We're excited to see results and any changes happening with practices being implemented. Soil Conservation Technician Becky Van Wey assisting with site selection for a saturated buffer installation. This field now has a saturated buffer installed. By installing a controlled drainage structure, most of the water running from the field tile directly into the stream is diverted to run along the edge of the field-parallel to the stream. 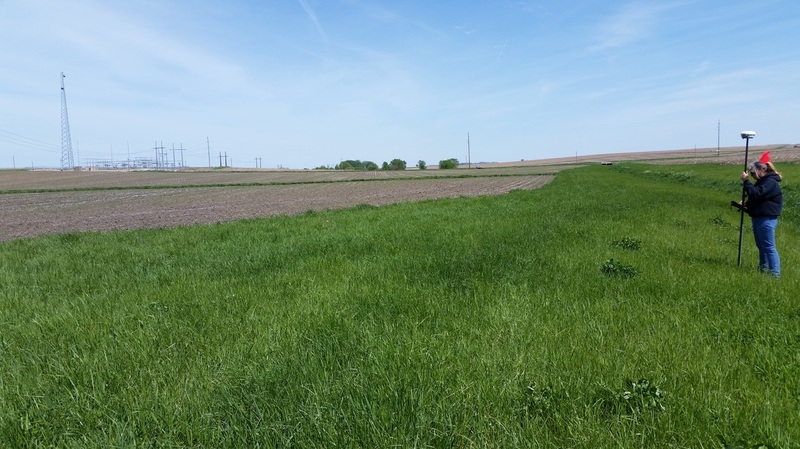 The grasses on the buffer use that water and the nutrients in it, thereby significantly reducing the amount of nitrates entering the stream from the field.